The grounds looked beautiful during the heavy snowfall at the end of February. Year 4 had great fun when Warburtons came in to visit us on the 8th February. The lesson helped the children learn by providing the right tools and information to make informed decisions about their health and wellbeing. The children learned how bread is made and they made their very own healthy sandwich! The children and staff had a lovely time and enjoyed ourselves. Bunnies invited the parents and their families to participate with the children in a mini sports day in the Nursery. We welcomed over 40 family members and friends. The sun was shining and a fun day was had by all, followed by a cream tea. Mr Holmes and the children had a wonderful day in the woods at the front of our school. One of the objectives was to create a piece of land art using natural materials. World Book Day turned into Book Week at Tree Tops Primary Academy. 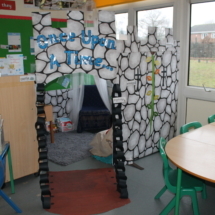 The children and staff worked hard on reinvigorating their book corners and the winners spent £50 on new books! The parents joined us for an afternoon of reading and we were lucky enough to have two authors visit us; Lotte Moore and Richard Dodd. They shared their books with us and answered our questions about being authors. Richard launched an exciting competition where the children have been asked to invent a villain for his next book. The winner will have the book dedicated to them and receive a hardback edition before anyone else!